Hear, O Israel, the Lord our God is one Lord. Thou shalt love the Lord thy God with thy whole heart, and with thy whole soul, and with thy whole strength. And these words which I command thee this day, shall be in thy heart: And thou shalt tell them to thy children, and thou shalt meditate upon them sitting in thy house, and walking on thy journey, sleeping and rising. And thou shalt bind them as a sign on thy hand, and they shall be and shall move between thy eyes. Let us, therefore, not be ashamed of the Cross of Christ; but though another hide it, do thou openly seal it upon thy forehead, that the devils may behold the royal sign and flee trembling far away. Make then this sign at eating and drinking, at sitting, at lying down, at rising up, at speaking, at walking: in a word, at every act. This was given to us as a sign on our forehead, just as the circumcision was given to Israel: for by it we believers are separated and distinguished from unbelievers. Because of what the Sign indicates -- the very Cross of our salvation -- Satan hates it, and our using it makes demons flee. Make the Sign in times of temptation and confusion for great spiritual benefit! 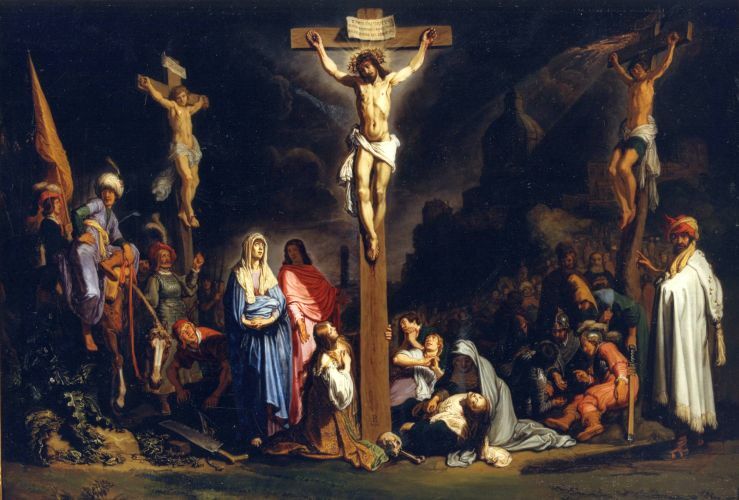 By the Sign of the Cross, deliver me from my enemies, O Lord. Mark all your actions with the sign of the lifegiving Cross. Do not go out from the door of your house till you have signed yourself with the Cross. Do not neglect that sign whether in eating or drinking or going to sleep, or in the home or going on a journey. There is no habit to be compared with it. Let it be a protecting wall round all your conduct, and teach it to your children that they may earnestly learn the custom. 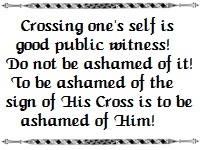 Catholics should begin and end their prayers with the Sign of the Cross and should cross themselves when passing a church to honor Jesus in the Tabernacle, upon entering a church, and after receving Communion. The sign is made, too, in times of trouble or fear (e.g., when receiving bad news, in times of temptation, when hearing an ambulance or fire truck go by), when passing a cemetery or otherwise recalling the dead, when seeing a Crucifix -- any time one wishes to honor and invoke God, or ward away evil, fear, and temptation. Just for information's sake, the "Distaff Gospels," a collection of old wives tales collected ca. 1470, relate the following in its fifteenth chapter. If in the morning, when getting up, a person crosses themselves and washes their hands before leaving the house, the devil will not have the power of harming him or her. Otherwise, whatever the work is done on that day will not be profitable. ...About that, Geffrine Tost Preste said that the devil sits on the table of whoever does not say grace before eating, then eats and drinks there. There are other signs of the Cross that Catholics make, too. One is made by tracing a small Cross with the thumb of the right hand on people and things. This sign is especially used by parents when blessing children by tracing the sign on the children's foreheads..1 Sometimes the sign is traced by the thumb on a book of Sacred Scripture and then kissed before reading. The sign is also carved onto loaves of bread before cutting, etc. Another sign is the large sign made in the air by bishops and priests when blessing persons or material objects. 1 The use of "bless" here refers to a parental blessing -- i.e., a prayer for God's grace for a child. Priests alone have the power to bless in the name of the Church and with the power of the Church, to bless liturgically, to bless objects rendering them sacramentals, etc. 2 When passing by or upon entering a church, many Mexicans make this form of the sign (with the thumb laid over the index finger to form a cross) -- on the forehead, lips, and mouth -- while praying the words, "Por la senal de la Santa Cruz, de nuestros enemigos libranos Se�or Dios Nuestro" -- "By the sign of the Holy Cross deliver us, Lord, from our enemies." This is followed by the regular sign of the Cross outlined above (whose words in Spanish are, "En el nombre del Padre, y del Hijo, y del Espiritu Santo, amen") and the kissing of the Cross made by the thumb laid over the index finger. They refer to the first sign as "signing oneself" ("signarse") and the second action as "blessing oneself" ("santiguarse").